Affymetrix GeneChip Array Station w/PC&Software Caliper Zymark SciClone ALH 3000 . New Life Scientific, Inc.
Caliper Life Sciences combines microfluidics, liquid handling and laboratory automation to deliver unique research tools for today's drug discovery and development. This equipment would be a perfect implement for any laboratory that requires an automated system that is user friendly. The robotics will need to be programmed for your individual needs. In our product video, our technician shows that the robotics do work in various positions and the Z8 tips raise and lower independently of each other. He also demonstrates that the Syringe bulk reagent head raises and lowers. Along with this system is 3 tall racks for the Twister II. Missing is the Z8 bulk reagent syringe pumps and the Bio-Rad remote head for the thermal cycler. The Sciclone, Twister II and the Thermal cycler are integrated into a single user interface. ** The Bio-Rad DNA Engine Thermal Cycler is NOT included with this listing. It only includes DNA Engine, the Alpha Dock remote adapter. The remote head will need to be sourced by the buyer if they intend to run certain assay steps, e.g., incubation, fragmentation, denaturing, etc. 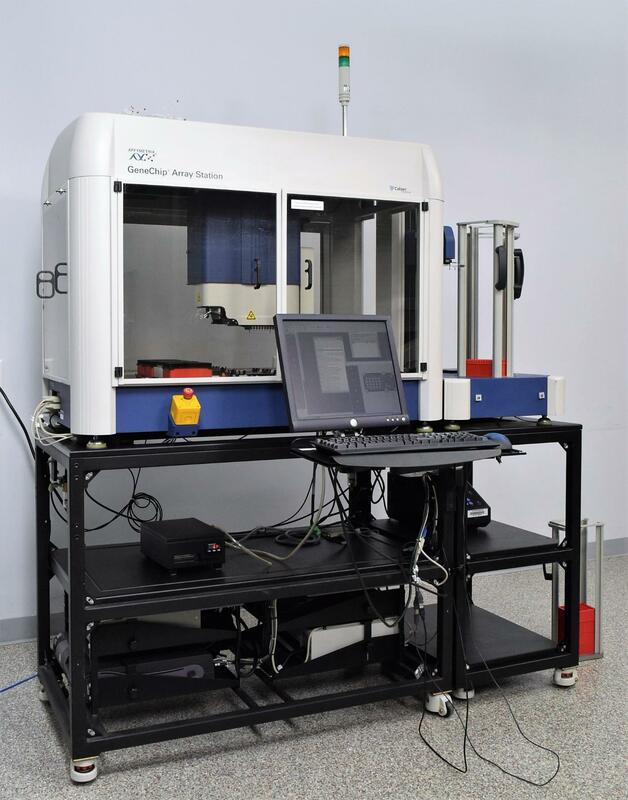 Our in-house technician inspected and tested this Caliper Zymark SciClone ALH 3000 / Affymetrix GeneChip Array Station, confirming it to be good working condition. Technician tested the robotics to function smoothly in different positions and that it retrieves and places plates in their desired areas. The temperature controller is functional and is necessary to set the temperature of the reagent cold block on the deck and for controlling the temperature of the high stringent wash buffer. The Z8 tips function independently, as well as the Syringe bulk reagent head, both raise and lower without any issues.